The babyTUX Digest came as an idea to some of us to create an online magazine that covered Free & opensource software(FOSS) and related technologies. It is probably the first FOSS Magazine from Sri Lanka, carrying several articles by local writers. The magazine hopes to cover a wide range of FOSS applications in the style of reviews, how-do-i/how-to etc. as well as other local news and events related to the local FOSS movement. While it is primarly written for the intelligent newbie, there will be some articles for the intermediate and advanced user as well. To commemorate the launch, there was a small private party at "The Commons", which was attended by few key contributors to the project as well as some well wishers (who'll hopefully be future contributors). Arunan, who is also the Editor, gave a run down of the pilot issue and enlightened the gathering as to how and why it was put together. In addition to the local writers, several foreign writers have also provided articles for the first issue. 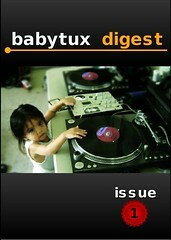 The magazine, which is being distributed via a Creative Commons License, can be downloaded from the BabyTUX Digest website - http://digest.babytux.org. Don't forget to sign up for the babytuxdigest googlegroup to be notified as soon as a new issue of the magazine is released. For the moment, the babyTUX Digest will is planned to be released once every two months.